West Liberty University presented the Carol M. and Terry A. Wallace Scholarship for the first time today in a special presentation held in New Martinsville, W.Va. Honoring the donors and the new Bachelor of Arts in Organizational Leadership and Administration (BLA) cohort, now meeting at West Virginia Northern Community College, the presentation was made at WVNCC, 141 Main Street, New Martinsville, W.Va.
“This $500 scholarship is being presented for the first time to an adult student enrolled in WLU’s BLA program, which now meets at the WVNCC New Martinsville campus. We are grateful to the Wallaces for their support of higher education and thank them for the award,” said Dr. Thomas Michaud, dean of the School of Professional Studies and coordinator of the BLA. Funded by the Carol M. and Terry A. Wallace Fund for Education, the new scholarship recognizes the work of adult or nontraditional students. “We hope that other donors will take this as a challenge to do the same as they have so many other times, in so many other schools. We look forward to doing even more in the future,” Terry Wallace said. Residents of Bellaire, Ohio, the couple have worked in and supported higher education throughout their professional careers. 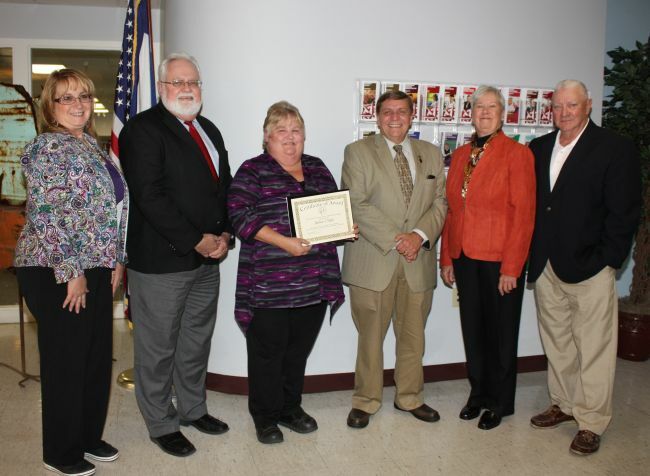 Michaud, WVNCC Office Administrator Debbie Bennett and Dean of WVNCC’s New Martinsville Campus Larry Tackett were on hand at the presentation to explain the recent expansion of the BLA degree completion program, and to introduce Janice I. Hall, the student receiving the award. “I’m speechless, this is such an honor,” Hall said. A resident of New Martinsville, Hall first began her degree about 14 years ago after getting married and having children. In 2009 she returned to school at WVNCC, obtained three associate degrees in arts, criminal justice and psychology, then began the BLA program at WLU just last January. “The BLA is a wonderful degree; it works well with other adult responsibilities. It gives you an opportunity you might not have otherwise,” Hall said, explaining that she quit high school at age 16 and had to obtain a GED to even entertain thoughts of college. Though she is currently unemployed, she is anxious to finish the program in August 2014 and transition back to the work world, where she previously worked in the behavior health industry. “I want to give back to my community and work in the criminology field after graduation.” A resident of New Martinsville since she was 18, she has four adult children and one grandchild. West Liberty’s BLA program will begin a new cohort in New Martinsville in January 2014. Interested students should contact the BLA program coordinator, Mary Lou Conley, at the Highlands Center, 304-217-2800, extension four. The BLA and other degrees such as the Regents Bachelor of Arts degree and the Bachelor of Applied Science degree are specifically designed to serve the non-traditional college student who needs a flexible schedule. Led by President Robin C. Capehart, West Liberty is accredited by The Higher Learning Commission of the North Central Association of Colleges and Schools. For more information on WLU, please call 1.866.WESTLIB.